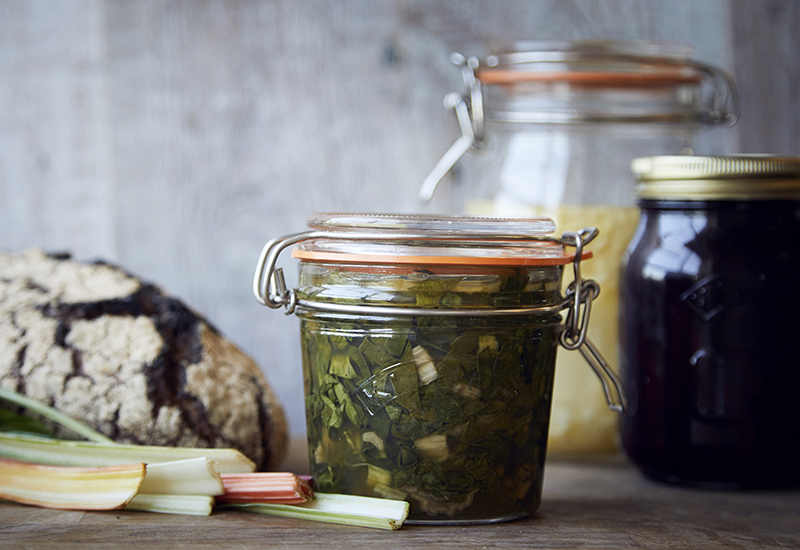 Release your inner Polish grandmother and slow things down with fermented seasonal veg. 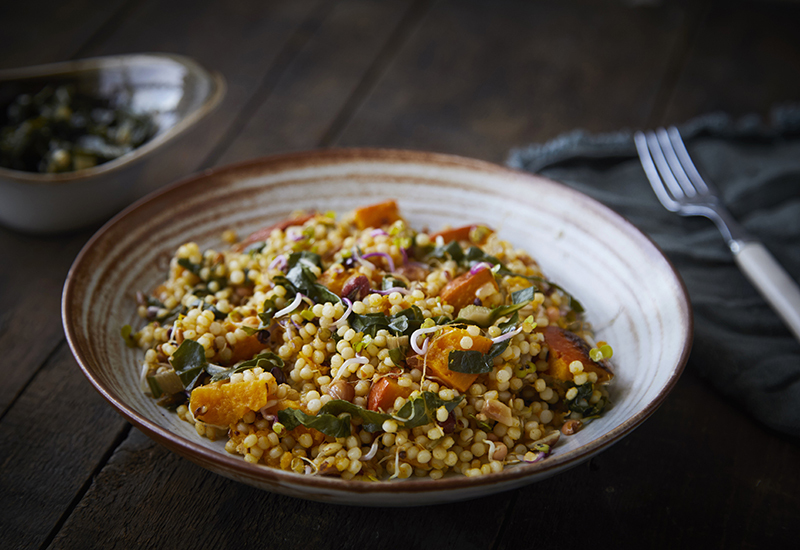 Try your hand at preserving rainbow chard and adding it to krupnik herby vegetable soup and pearl couscous salad all winter long, with the help of food writer Zuza Zak who grew up in Poland and now cooks in London. Autumn feels like the right time to ferment. 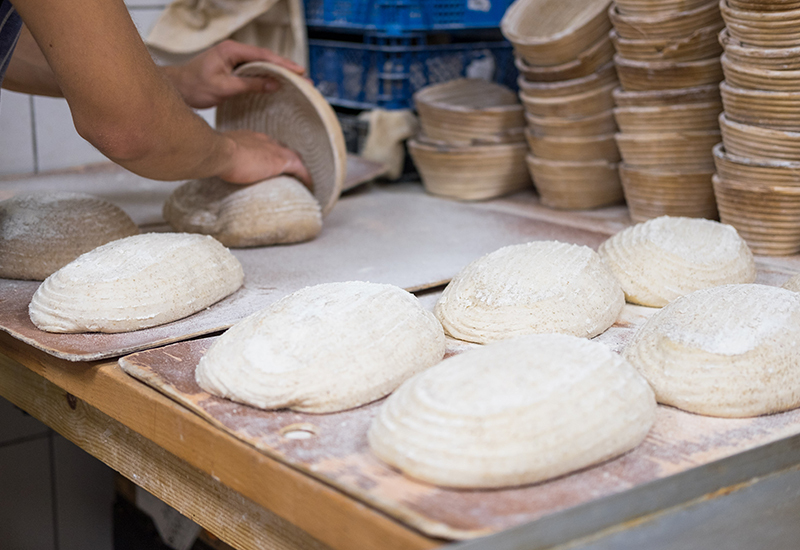 Whilst in the UK we still get a few crops during the wintertime and fermenting is not a necessity, it has recently been discovered to have a myriad of health benefits. Of course, Polish grandmas already knew that and didn’t need a scientific study to tell them what’s good. Here, I have developed a couple of recipes in which we can use fermented rainbow chard – my recent favourite ferment. Fermenting is simple, don’t let anyone tell you otherwise, be led by your intuition (your inner Polish grandmother) and your nose. If it smells off, bin it and try a different container and/or a different spot. 1. Wash a bunch of fresh rainbow chard and chop reasonably finely. You could reserve one whole leaf for the top. 2. Place the chard in a ceramic container and pound it with a pestle or a rolling pin. 3. Cover in warm water with a tablespoon of sea salt dissolved in it. If you have reserved a leaf then fit it over the top. 4. Use a weight to push the chard down under the water. 5. Leave at room temperature for 4 to 5 days, then move to a sterilised jar and into the fridge. 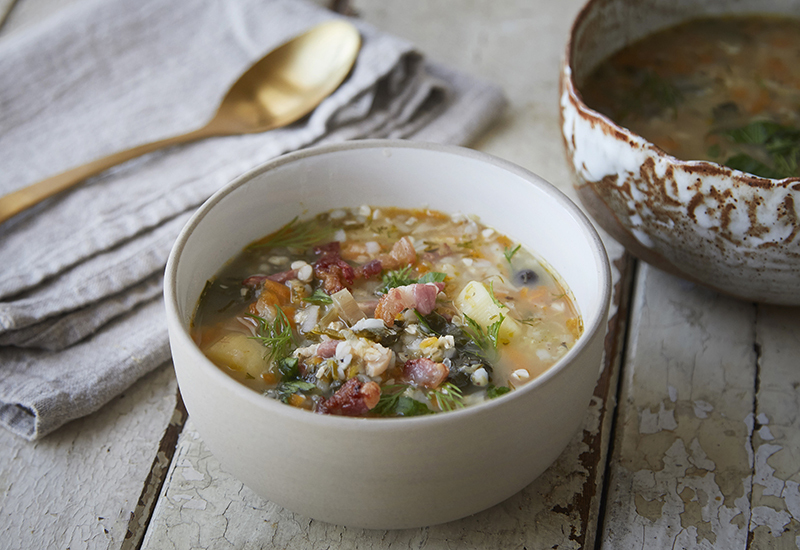 This is a traditional Polish soup for the colder months – I like to make it so thick that you question whether it’s still a soup. 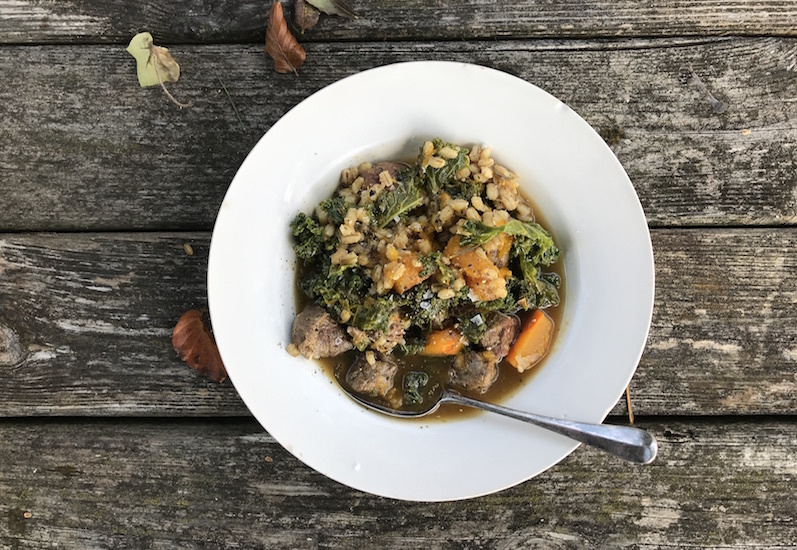 It’s in my cookbook Polska: New Polish Cooking, but with pearl barley and no fermented chard, as fermentation proper is a relatively new passion of mine. Once you start fermenting, you just want to add your ferments to everything. I feel like they improve the flavour of most dishes, and they give you (the eater) a new lease of life –perfect for this time of the year. Shop the recipe. 1. Place the chicken thigh in a large pan of water with the carrots, celeriac, parsnips, leek and bay leaves. Simmer on a low/medium heat for 30 minutes. 2. Add the allspice berries, peppercorns, potatoes and buckwheat and continue to simmer until both the potatoes and the buckwheat are cooked. 3. Season with sugar, salt and white pepper. Add the all the herbs and cook for a further 10 minutes. 4. Add the fermented rainbow chard and its brine. Simmer for a couple of minutes. 5. Finally, add the crispy bacon and serve. Seabuckthorn is a ridiculously healthy, extremely tangy and rather reclusive foraged berry. If you can’t get your hands on some, then replace it in the recipe with the juice of one lemon. If you are using an onion squash, then don’t you dare peel it – unless you are elderly or cooking for a toddler of course, in which case please continue to do so. I don’t, because for me the skin is the tastiest part, even though I actually am cooking for a toddler (I like to think that these kind of little challenges make her more robust, although my mother would probably say otherwise). Shop the recipe. Combine the seabuckthorn berries with the sugar and water and simmer on a low heat for about 30 minutes, squishing the berries down from time to time. Cover and allow to cool. Sieve the seabuckthorn berries into a bowl, pressing down all the time with a spoon, to get as much juice out of them as possible. 1. Cook the pearl couscous in water for about 10 minutes, then allow to stand for a few minutes. 2. Heat the rapeseed oil in a frying pan and add the spices. Allow to fry for a minute or two then turn the heat off. 3. Tip the couscous into the spices and stir them in. Allow to cool. 4. Chop the onion squash into small-ish bits and add to the couscous. 5. Add all the other ingredients and the vinaigrette over the top and allow to stand for at least 20 minutes. 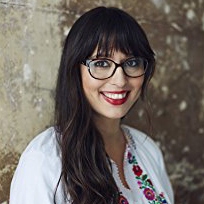 Discover more of Zuza’s Polish cooking on Instagram @zuzazakcooks and in her cookbook Polska: New Polish Cooking (Quadrille 2016) and keep your eyes peeled for some of her festive Polish dishes with homemade sauerkraut coming soon. I'm the author of Polska: New Polish Cooking and my two great passions in life are food and writing. Cooking Polish food is a way of reconnecting to my homeland. Tweet me @zuzazak.